Ashley J George | AD-ventures of a Creative: Christmas Candy! I got to spend most of the weekend making candy with my mama. It's always a good time of year, we make peanut brittle, sugar cookies, fudge, chocolate covered pretzels, seven layer bars and more. We will be packaging most of it up to give out as gifts to family and friends. 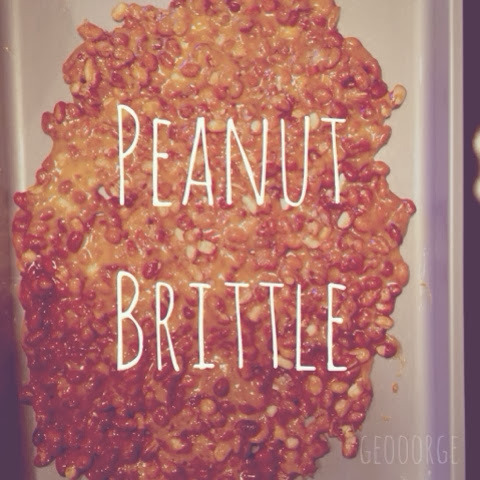 Here's a quick recipe on how to make Peanut Brittle. Enjoy!! Grease up your cookie sheet with butter. You want to do this first because you won't have time to do it later. This is a quick and dirty process. In a large glass bowl, mix sugar, corn syrup, salt, peanuts and water. Place in the microwave on high for about 4 minutes. Stir until sugar is dissolved. Place back in microwave for about 3 minutes. This is a very experimental process depending on your microwave. Take out of the microwave, immediately stir in butter and baking soda. There is going to be a fizzing effect starting to take place, ignore and stir fast. Pour the mixture on the cookie sheet. With a wooden spoon spread the mixture out QUICK! Then let it harden. Break into small pieces and enjoy.